Ok ok, just calling a film long and boring doesn’t add up to much. And it’s impossible to call this movie terrible; it’s far from it. I love the world of this film. I love how the technology that was introduced in the first film has evolved here. (Let’s be honest, the 1982 film hasn’t aged very well) There is ingenious stuff to be found here for sure. I love the film’s take on Alexa-like AI technology. 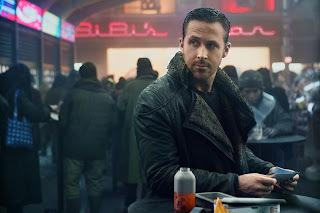 K (Ryan Gosling) has a holographic AI “girlfriend” named Joi (Ana de Armas, giving what is probably the trickiest performance in the film and she nails it). It’s his only real companion. This is a depressing, dystopian future highly reliant on technology of course. I love the grounded reality Gosling and D Armas bring to these scenes. Wonderful. Also great is a stunning performance from Sylvia Hoeks and her bangs, who bring terrifying robotic depth to a fantastic android villain. Roger Deakins. The go-to brilliant cinematographer. Arguably the best living DP working today. It’s not surprisingly a visually arresting picture. What he can accomplish with light and color is breathtaking. Is this the best looking film he’s ever worked on? Not necessarily, but it’s certainly worthy of praise. I say it’s between him and Hoyte Van Hoytema (“Dunkirk”) for Best Cinematography this year. The same goes for the music; Benjamin Wallfisch and Hans Zimmer’s loud score is fine with faint reflections of Vangelis’ original brilliance. But great visuals and music can only get you so far in a film that’s pushing three hours. The story is what’s hard to become emotionally involved in. In such a bleak future I find it hard to find anyone to really care about. Hampton Fancher (who wrote the original) and Michael Green’s script has a lot to say about technology and where it’s going. But it takes too long to say it. Is it even possible to describe the plot of “Blade Runner 2049?” I don’t believe in spoiling anything so all I’ll say is that Gosling is a young Blade Runner (one who tracks down and kills Replicants) who’s discovery will lead him to seek out Deckard (Harrison Ford’s character). There’s a mystery element to the film that follows closely to the “noir” style of the original which works here. Denis Villeneuve is a fascinating filmmaker ("Arrival" and "Prisoners" are damn near perfect) and is graceful when it comes to paying homage to the original film while pushing things forward in a new and interesting way. In a lot of ways he was born to make a Blade Runner film. Looking at the slower paced, deliberate style of his previous efforts, it all makes sense. Every shot is composed so well; I find no fault in the direction, it’s the story that just doesn’t click with me. The performances work, Gosling fits in perfectly playing up his dark, brooding charm that he does best. The Blade Runner world works, and the evolution of this world all makes sense. The films complement each other greatly, but I found the first movie’s pacing is shockingly slow. And that similar pacing and longer running time makes this a challenging film to really love.